81″ discharge height, 45° discharge angle. 7” discharge projection with tapered chute. 52” wide x 48” deep elevated container skip. Heavy wall stainless steel tubular frame construction with structural bracing and continuous welds. Heavy-duty stainless steel dump bucket with structural reinforcements for strength. Includes hard pivot stop bumpers. Fixed hold down bars to lock in the container. Reinforced 2” diameter stainless steel pivot shaft with piloted flange bearings. Dual nickel plated rear mounted pivot cylinders for smooth bucket rotation. Acrylic safety caging with stainless steel frames and load side light curtain. Manual reset button if light curtain is interrupted. 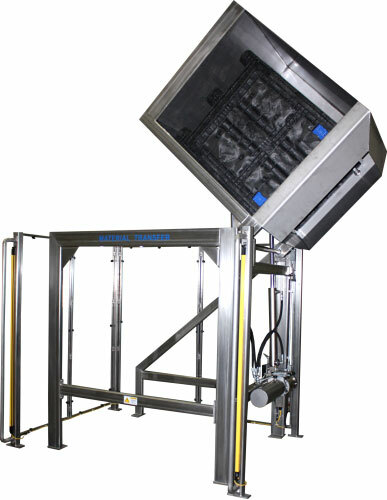 Hoffman NEMA 4X stainless steel enclosure with momentary contact controls. 2 GPM Barnes hydraulic system with 2 HP motor. Entire hydraulic unit is stainless steel.